Fun Fact #127: I started cross stitching when I was about 14 years old…which makes this year the 20th year I’ve been doing it. 20 years?? Weird. Anyway, I thought I would post about how I keep a 20 year habit obsession hobby together and organized. Luckily, floss and needles don’t take up as much space as say, yarn. Maybe that will be a future post…something along the lines of “where I stash my stash without tripping on anything or getting in anyone’s way”. 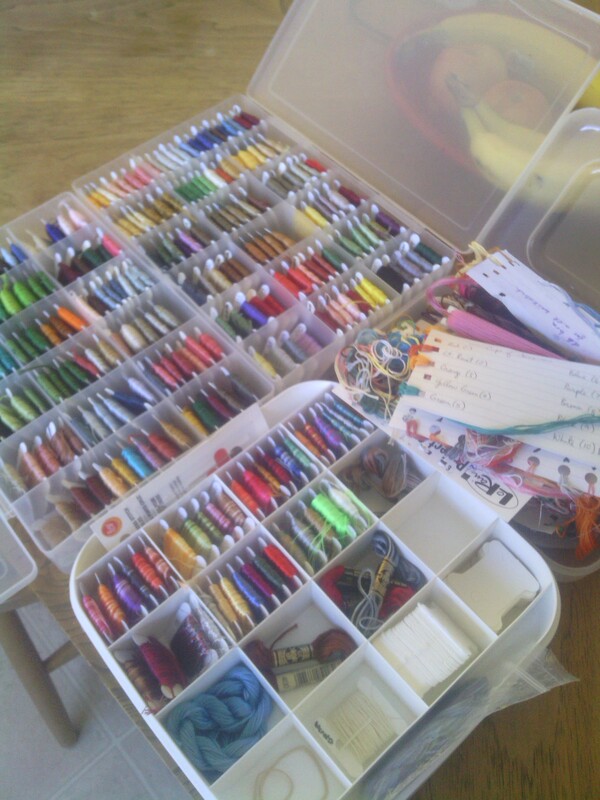 I use various crafty boxes for the thread or I re-use boxes I acquire. I started using bobbins only a couple years ago, before that I used the DMC bows. Those were ok, but not very easy to organize. I have binder inserts for them and everything, but once my thread stash got bigger I had a hard time finding the colors I wanted or arranging them. I admit it’s easy-peasy to just hook the skeins onto the bows, but way too difficult for me to have to take all the bows out, then move them around just for one or two new colors, you know? I organize the bobbins by number and brand after labeling them (with a Sharpie) and winding them. (I mostly use DMC but Anchor makes some gorgeous variegated colors). The messy box in the back corner is my scraps box from finished kits. (This is great for embroidery!) I have both plastic and paper bobbins. I don’t have a preference really. I. Love. Boxes. And tins. I can’t have enough of them! 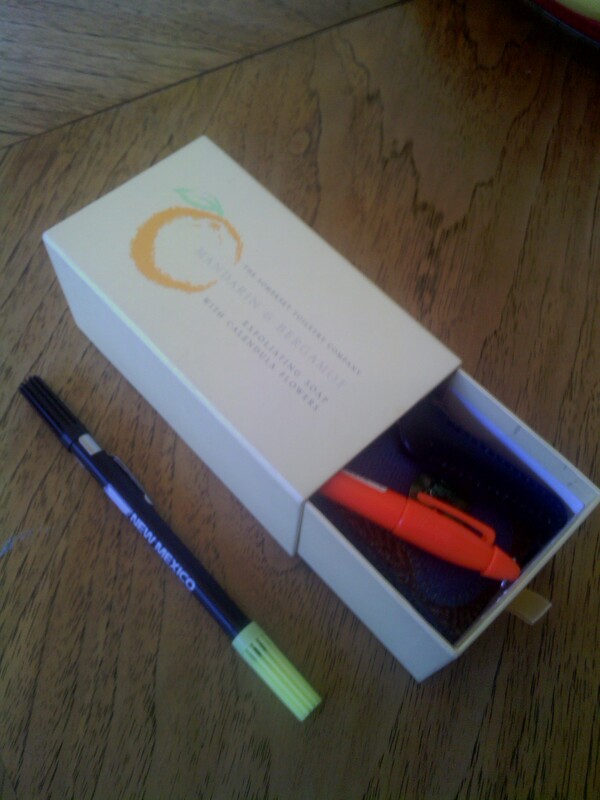 This box is a soap box that stills smells like oranges. I tore out the paper inside and just use it as is. 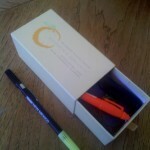 The highlighter/pen won’t fit in there, but I love these things so much I had to include it. I can write notes on a pattern and highlight. Joy! I even found them at a big box office store recently, so I may have to buy a pack. 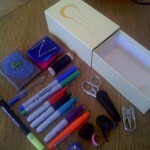 I keep scissors, Thread Heaven (useful for those pesky but pretty metallics), highlighter, thread cutter, needle books, thimbles, strong thread, and Sharpies in my notions box and I keep the notions box in my current WIP bag. That’s it for now. I’ll get into how I plan out and organize a project in Part 2 that explains the Sharpies. I’ll have lots of pictures of boxes and tins! Whee! I tried the bows too but it was frustrating. Plus I hate spending oodles of money on stitching stuff that’s not fabric or thread. You did send me that soap box! I finally used up the soap all these years later, ha. That’s how I feel about the bows. The bobbins are a few bucks for 50+, where the bows are much more and take up more space.